MyPhone My88, My87, My86 Also Leaks! Marshmallow 64 Bit Octa Core Phones Under 6K Pesos! Home / leaks / mobile / myphone / MyPhone My88, My87, My86 Also Leaks! 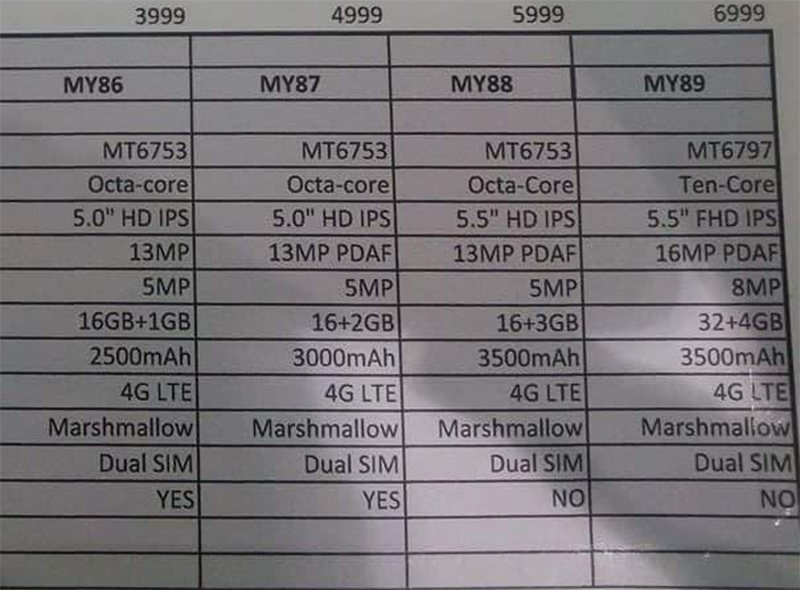 Marshmallow 64 Bit Octa Core Phones Under 6K Pesos! Aside from the monstrous My89, there are 3 other MyPhone bang per buck smartphones that was leaked by an unknown tipster, the My88, My87 and My86. MyPhone My88, My87, My86 also leaks! First the MyPhone My88, a toned down My89, but still a very promising handset. It touts a 5.5 inch HD IPS screen, MT6753 octa core chip, large 3 GB of RAM, 16 GB ROM and 3,500 mAh of battery capacity. This device also features a 13 MP rear camera with PDAF, 5 MP selfie camera, LTE connectivity and dual SIM slot. Next is the MyPhone My87, a smaller handset yet rocks very capable specs under 5K. This phone has a 5 inch HD IPS screen, 2 GB RAM, 16 GB ROM and 3,000 mAh of battery. Aside from that, this has the same 13 MP PDAF ready cam at the back, 5 MP selfie camera, LTE connectivity, dual SIM slot. Last is the most affordable of them all, the MyPhone My86. It has a 5 inch screen, 64 Bit MT6753 octa core processor, lower 1 GB RAM, 16 GB ROM and 2,500 mAh of battery. You'll also get a 13 MP shooter without the PDAF tech at the back, 5 MP selfie cam, LTE capability and dual SIM slot. All devices runs on the newer Android 6.0 Marshmallow OS. The rest of the details is still unknown for now. Let's wait for further announcements and clarifications from MyPhone.